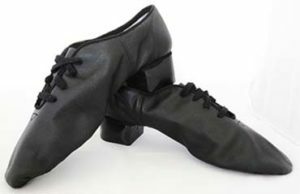 There are three types of Irish dancing shoes; soft shoes for girls (also known as pumps or ghillies), soft shoes for boys (also known as reel shoes) and hard shoes or ‘heavies’ (the same for both boys and girls). Girls soft shoes are black leather with long laces that wrap around the foot. They are similar to a ballet slipper (not point shoes). Boys soft shoes are similar to jazz dance shoes but have a raised heel. The heel makes sound when the boys stamp and click while dancing. Hard shoes are leather shoes with raised tips and heels that are covered in fiberglass in order to make a “tapping” noise when dancing. This is the “sound” of Riverdance. Dancers usually don’t get into hard shoe dancing until the end of their second or beginning of their third year at the Culkin School. Most dancers can’t wait to get into those loud, tapping shoes! All Irish dancers enrolled in the Full-Time Yearly Program must have Irish dancing shoes. If you are a Beginner, we ask that you purchase your soft shoes by the first class in November. All dancers should come to class with their shoes because they are an integral part of learning this art form. If you are enrolled in a Mini-Mester or Summer Camp, Irish dancing shoes are not needed. 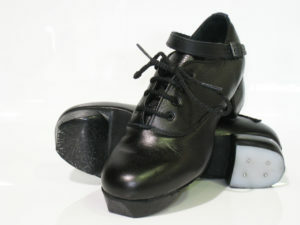 Since these are shorter introductions to Irish dance, we ask that you wear non-slip shoes that won’t fall off your feet. It will only be necessary to buy Irish dancing shoes if you plan to continue in the Fall with The Culkin School of Traditional Irish Dance.